arly as possible, so that while crossing over this treacherous terrines, in case if there was any breakdown of our car or if we got stranded, at least some one would come to our rescue. 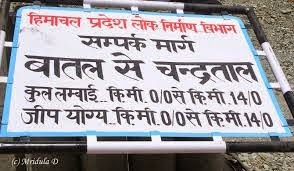 Since the petrol bank at Kaza town opens only after 9 Am. So previous night itself we filled our car tank to its full capacity. Next day after loading our car, by 6 AM once again we were on the move driving on the most bumpy road. 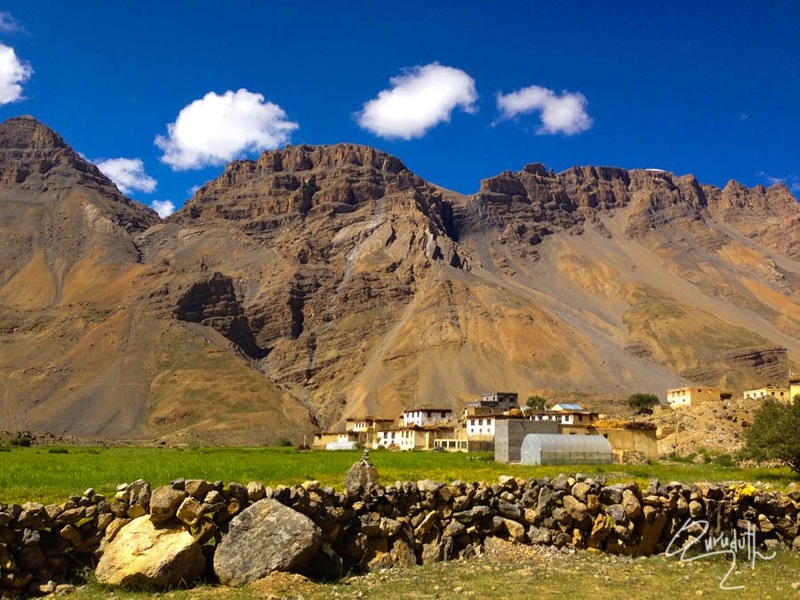 Losar, which is some 56 km west of Kaza and is also considered as western entrance to Spiti Valley. 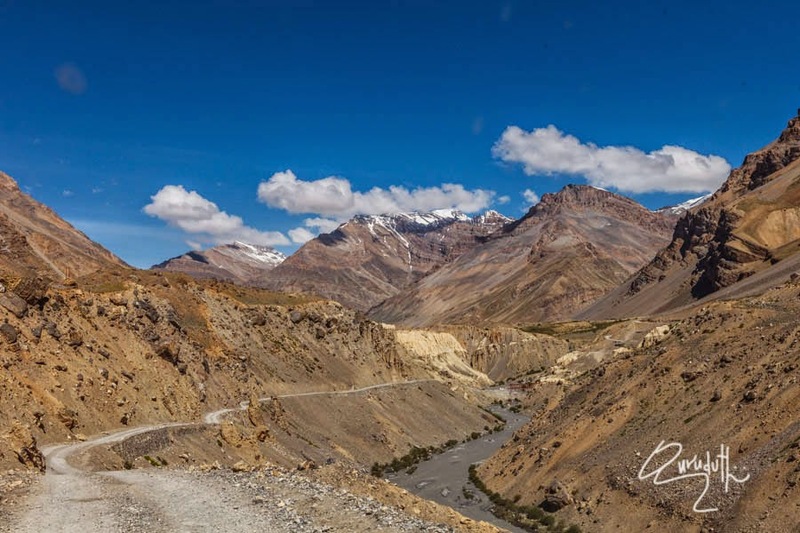 The road to Losar passes through some breathtaking patches of precipitous ravines, which infact is one of the most scenic segments in the entire region, where any sound echoes and vibrates three times. 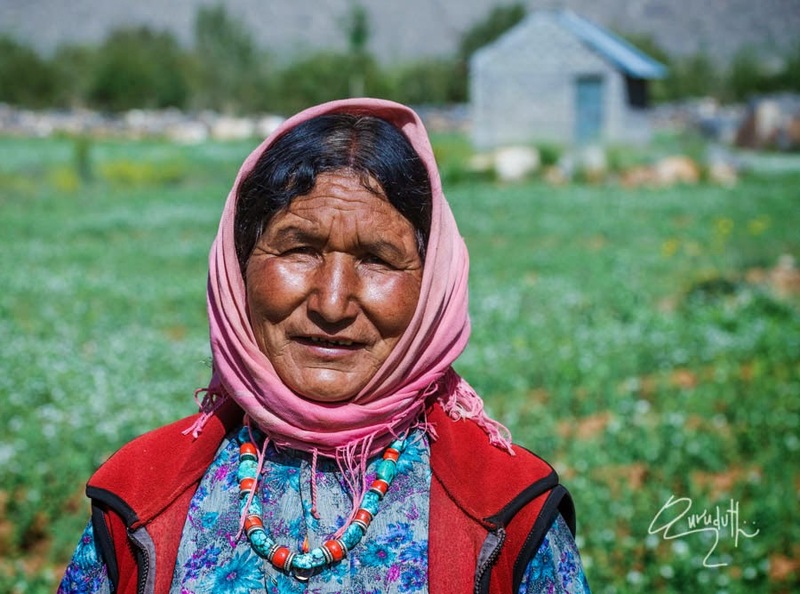 The village is prosperous because of rich agricultural products such as Potatoes and Sweet Green Peas. 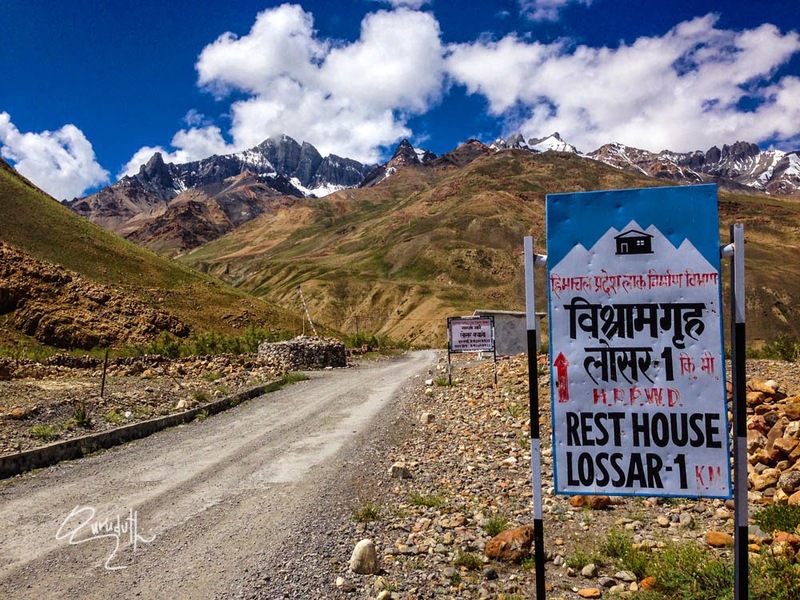 Some tourists who travel from “Tabo” to “Batal”, prefer to say over night at “Losar” village, because it is closer to “Kunzum La” pass” and “Chandartal Lake”. 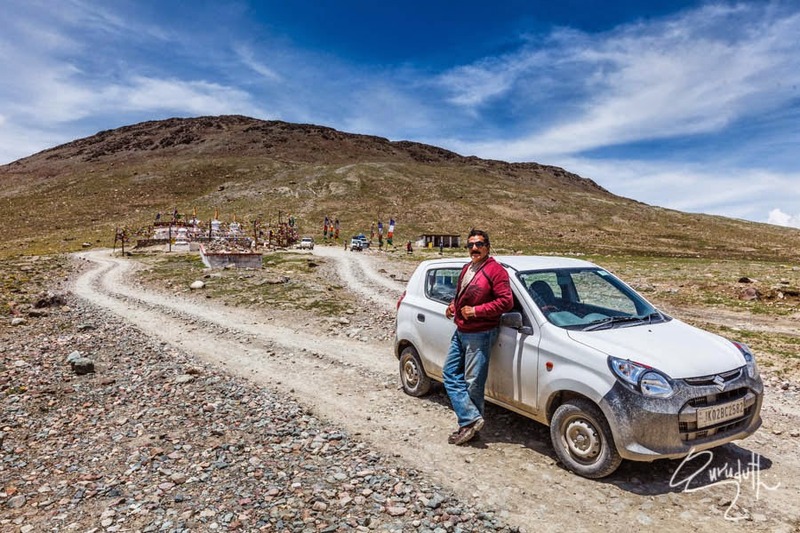 So far our journey had been absolutely delightful and our “Little Lilliput-ALTO” car also did a successfully fabulous job on those most scary perilous roads. So far we were contented and satisfied. 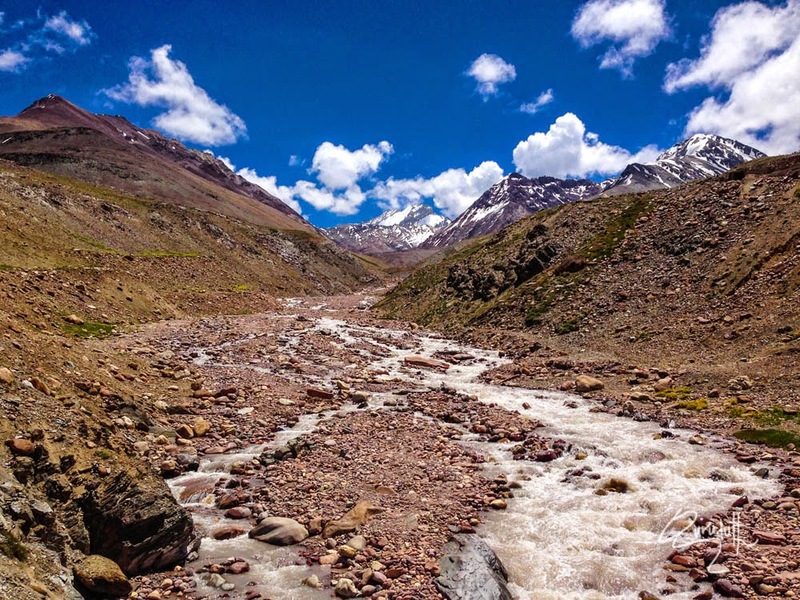 But the only anxiety which was heavy on our mind was how were we going in one piece to cross over “Kunzum La Pass” then to go to “Chandartal Lake” Set on the bank of Losar river (aka Spiti river), and near the confluence of “Losar” and “Peeno” streams. 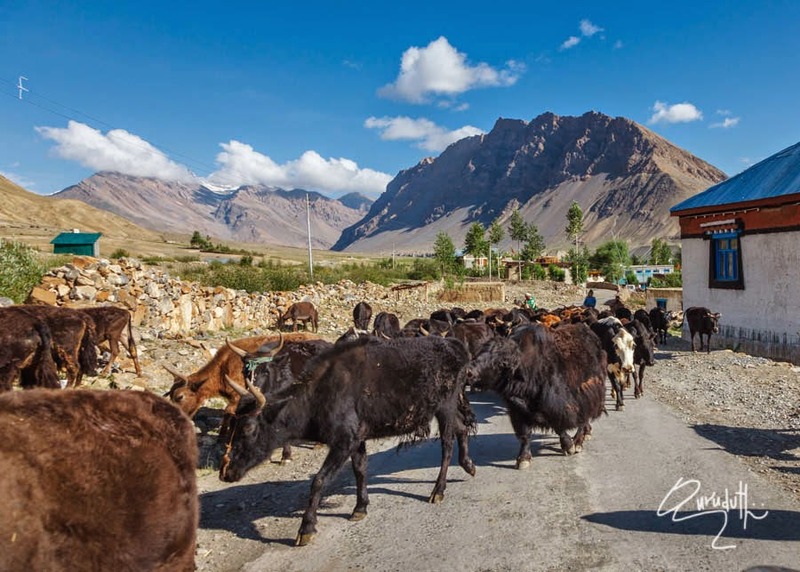 Losar is a picturesque hamlet adorned with the carpet of flowers on the pastures and ranches. And because of its Location. 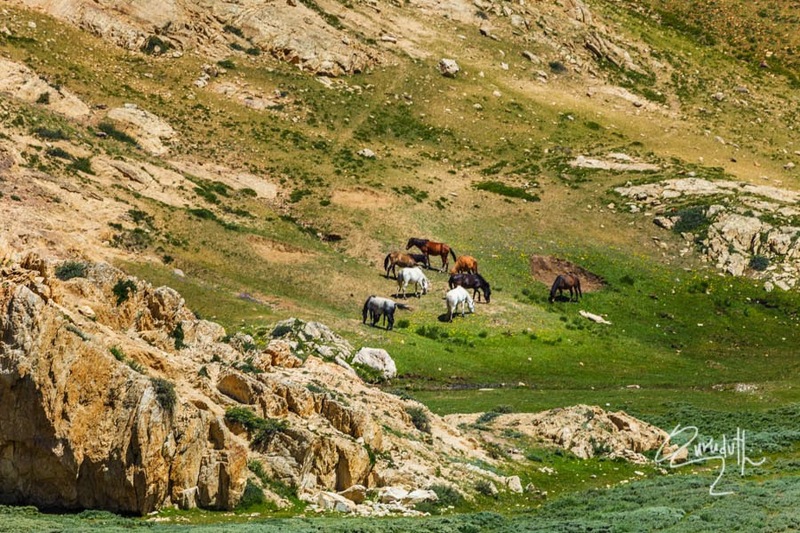 Yak and horse riding are other charms to add to its beauty and unique experience. 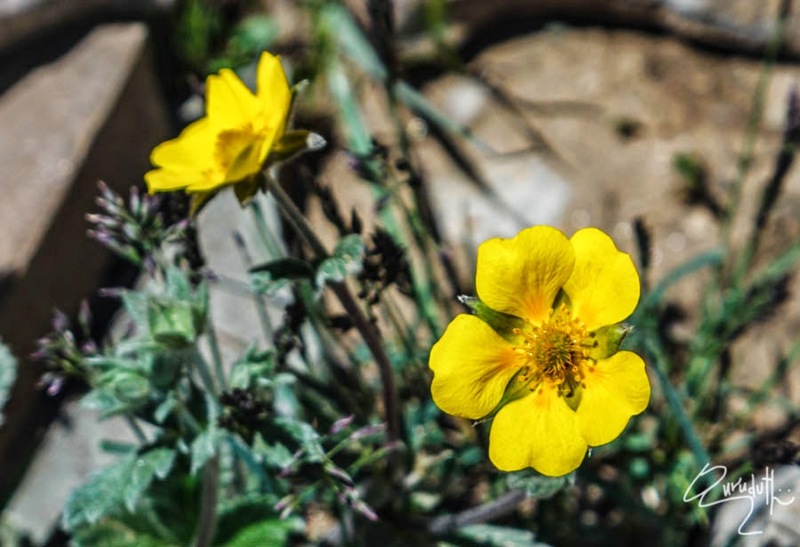 Losar offers basic tourist facilities yet awaiting attention on tourist trail. From Losar onwards it was a constant very steep ascend. 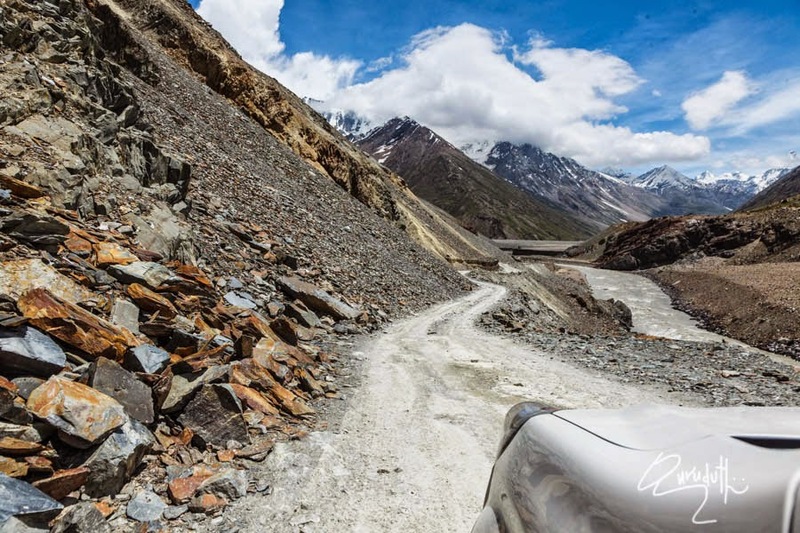 We have to drive from (13,400ft @ Losa) to (14,900ft @ Kunzum La) within a short span of distance through the narrow snake like endless winding road, till we reach top of the mountain that is “Kunzum La” pass. On the way we met shepherds who were grazing their herds of “YAKs” Horses as well as “Pashmina woolen goats” These goats are very small in size but the pashmina wool that is sheered from them is the most expensive wool, because it is very fine silk like smooth wool and is very very warm. That’s why a pure and genuine “Pashmina shawl cost varies from Rs. 50,000/- to a Rs.2,00,000. The proof to find out if it is a pure and genuine “Pashmina shawl”. The shawl smoothly and easily should pass through an adult’s “Finger Ring”. 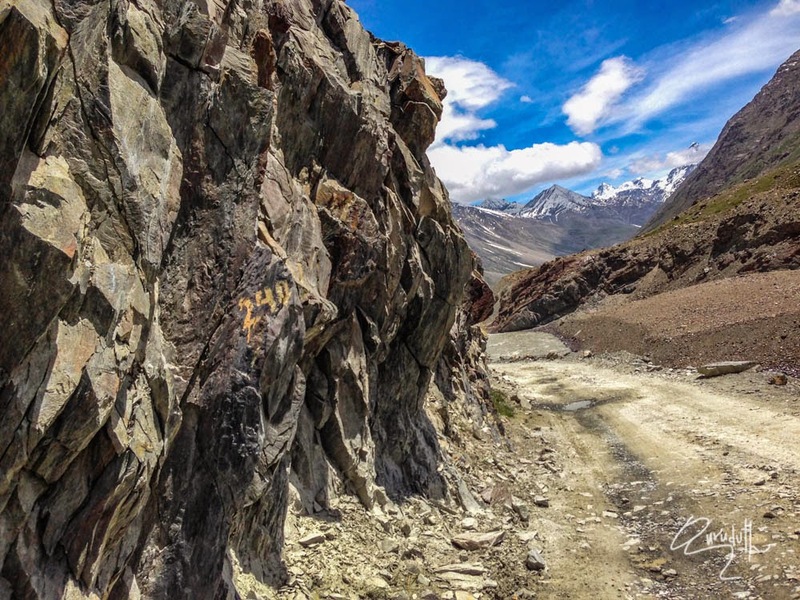 Kunzum pass separates Spiti and Lahaul Valley. 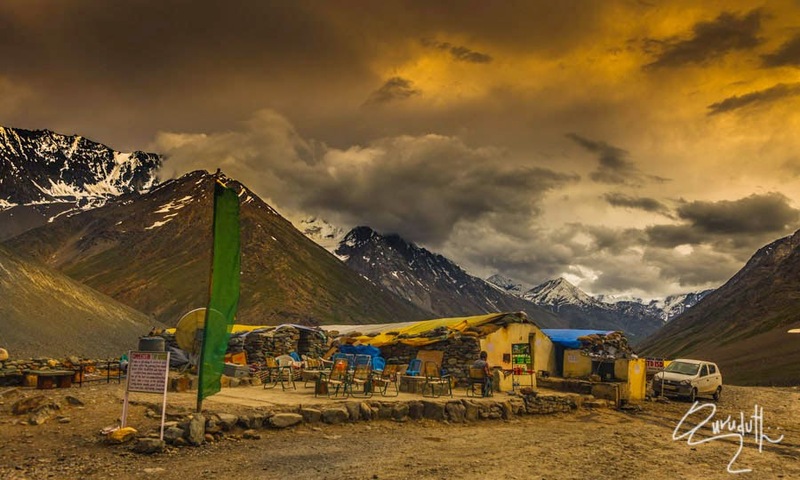 It is situated at a higher altitude than “Rohtang Pass”, which is at an elevation of (13,054 ft). 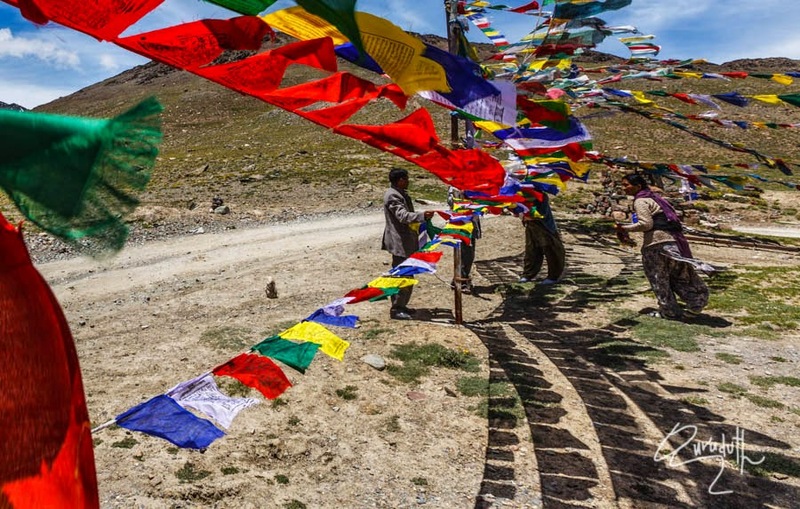 Signs of Buddhist influence in and around Kunzum La Pass, is visible in the form of “chortens” and prayer flags. 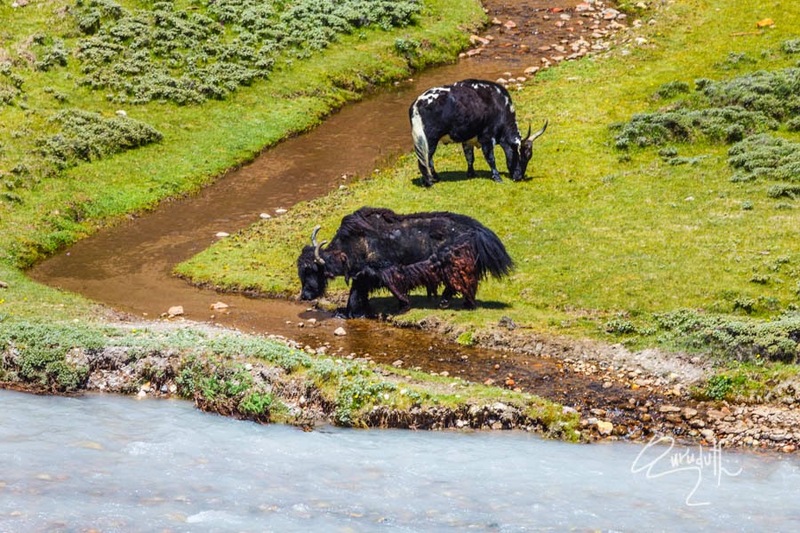 Kunzum La pass is also popular with trekkers and adventure seekers. 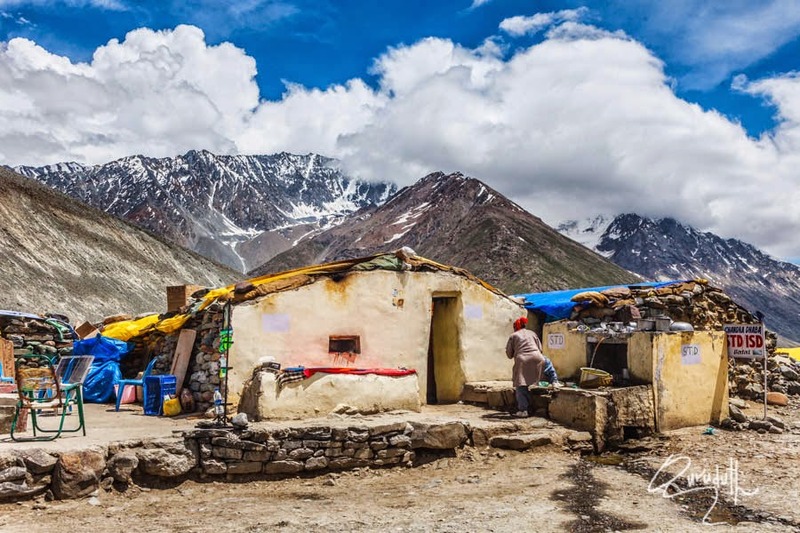 The 12 km trek to “Chandratal” is very popular. 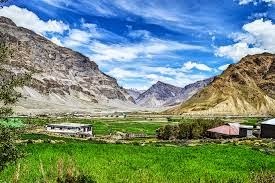 Just few Km before Kunzum La Pass, there comes a small area of green pastures those are full of greenery and colourful wild flowers and is adorned with a colourful small Gompa. 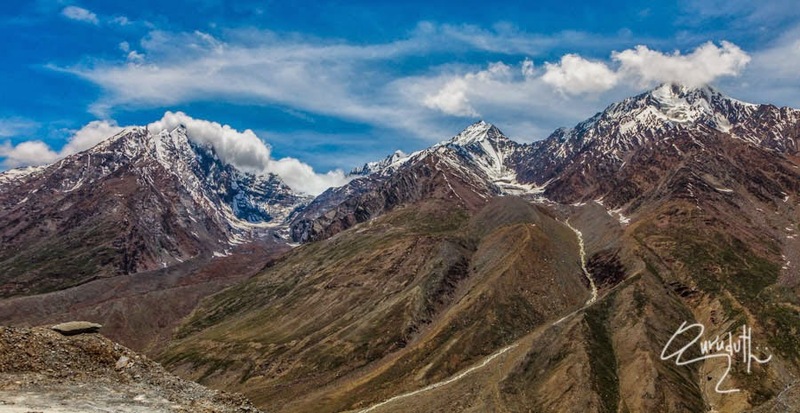 The backdrop of Kunzum La Pass offers spectacular views of “Bara-Sigri glacier”, the second longest glacier in the world. After a back breaking bumpy ride through this roughest and the toughest snake like steep road, finally we reached at “kunzum La” pass. We were extremely thrilled and excited with happiness that in one piece, we could make it up till here. 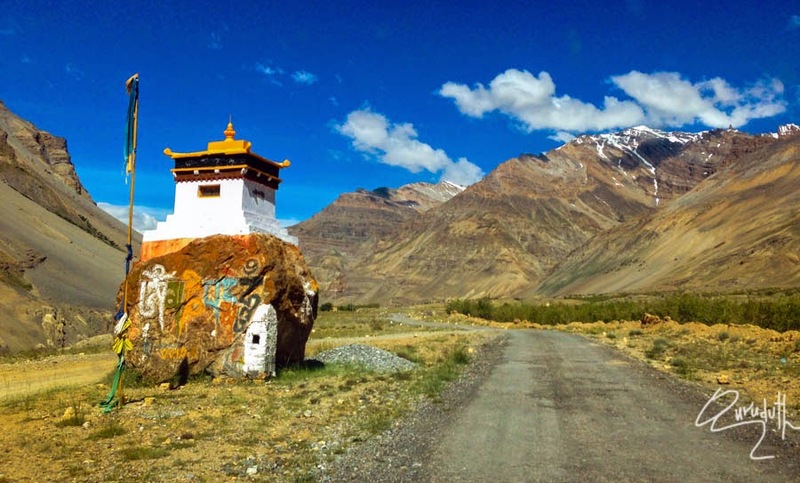 First we drove straight to “Kunzum La”, female Lama-Monk Gompa, which is about ½ Km away from the main road. 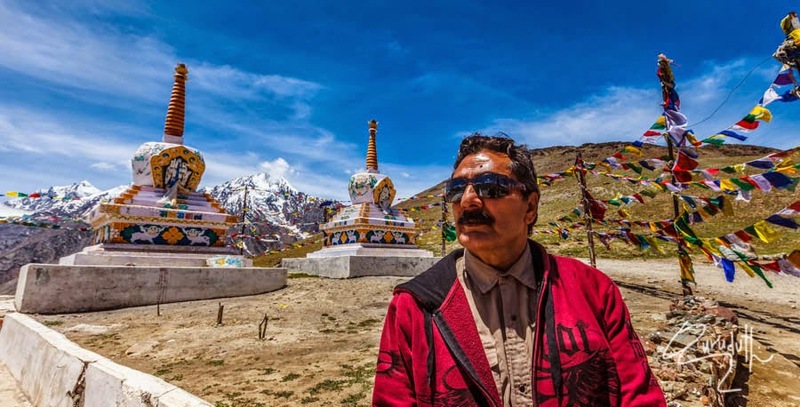 But the majestic view of the whole Gompa area with its back ground of majestic “Bara-Sigri glacier” is some thing out of this world. 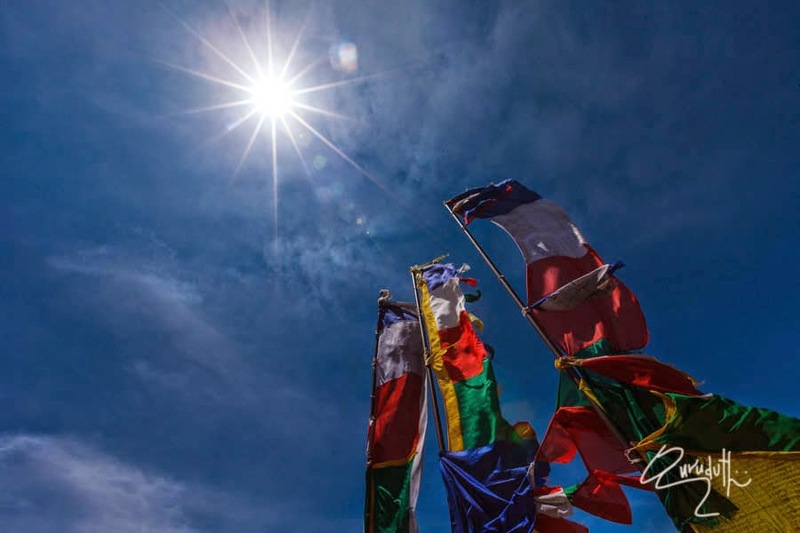 The Gompa area is awesomely spectacular with numerous numbers of Buddhist prayer multiple colourful fluttering flags, those are tied from high poles across temple in possibly cress cross directions. 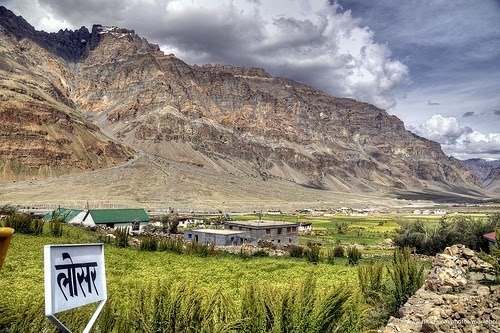 The Myth of the “Kunzum” Gompa is that there is a rock where Holy Kunzum female Monk had ascended and meditated to attain Mokasha (). The mythological rock has imprints of female Monk’s both the hands. When coins are offered and showered on the imprint of the Kunzum female-Monk’s hand on the rock. Almost all the coins which are offered stand for few minutes, on its edges, that mean your prayers have been granted. If the coins fall flat that means prayers are not granted. This mythological story is told to me by my eldest brother Mr. Moti Lal Parimoo, who retired as director of Geological Survey of India. During nemourous official assigmnemts he had been camping in these remotest anbd the most trecherous areas from 1964 onwards. 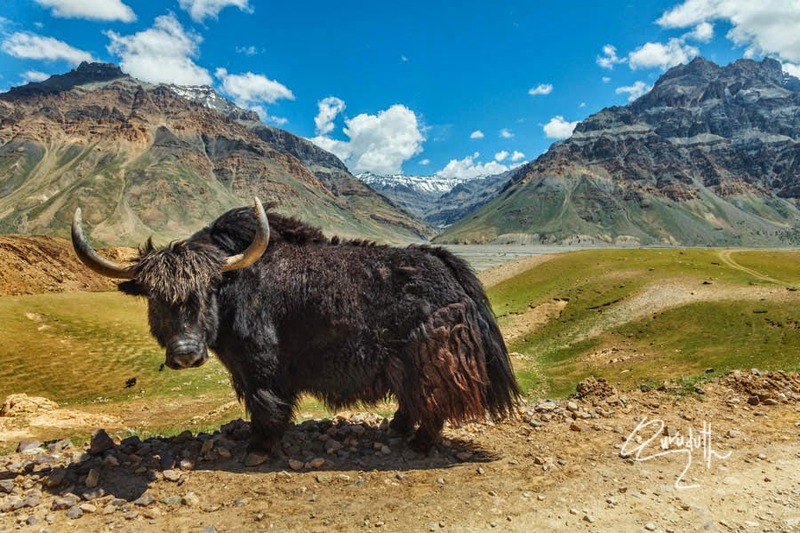 And those days the whole team would travel by “Yaks” as means of only transportation. Those days there were no roads at all. 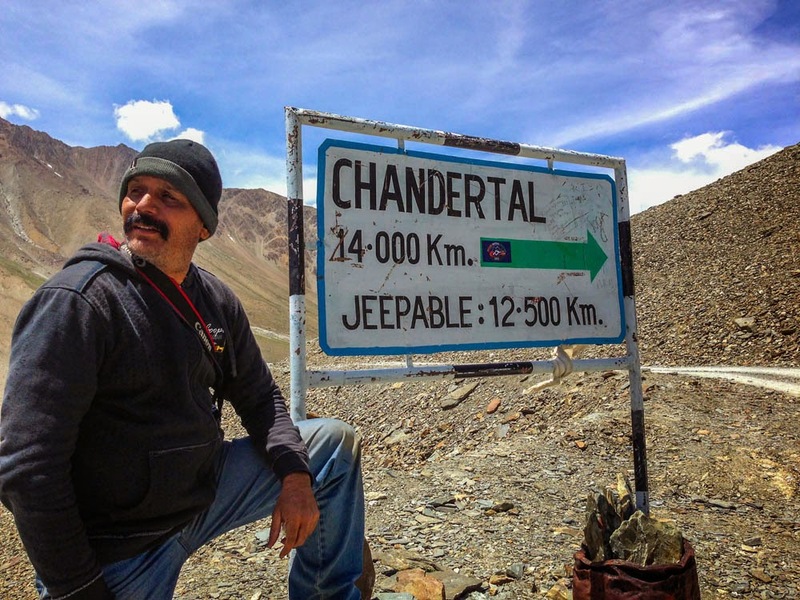 Mind you he still remembers the names, locations and the trek routes of every inch of these areas of “Pirpanjal and Dholadhar ranges”. His memory of these areas is amazingly as fresh as if he had travelled through these ravines just yesterday. Now a days because of road connectivity lot of tourists throng this Gompa and were Medellin with the divine rock. So to protect the sanctitiy of the rock, a concrete structure is built over the holly-rock. Now a days this rock is under lock and key. 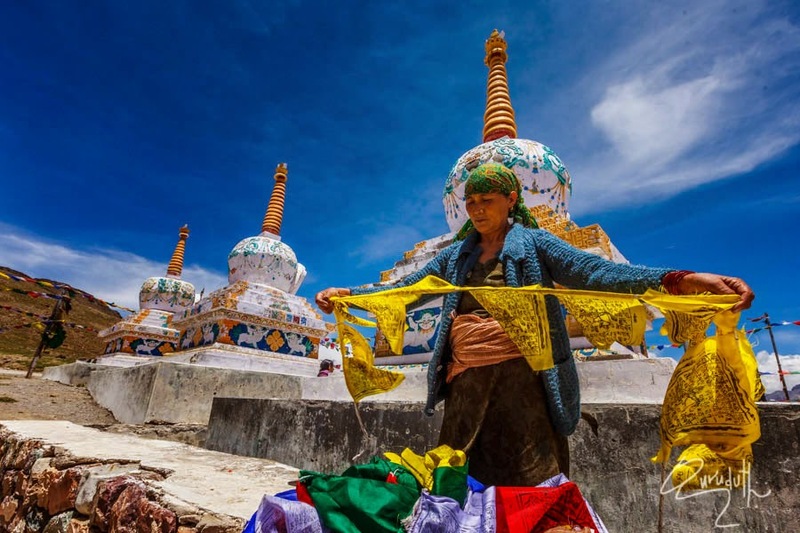 Now a days since most of the time, the temple doors are locked we cannot see the “Hand Imprinted Rock” of Kunzum female Lama. 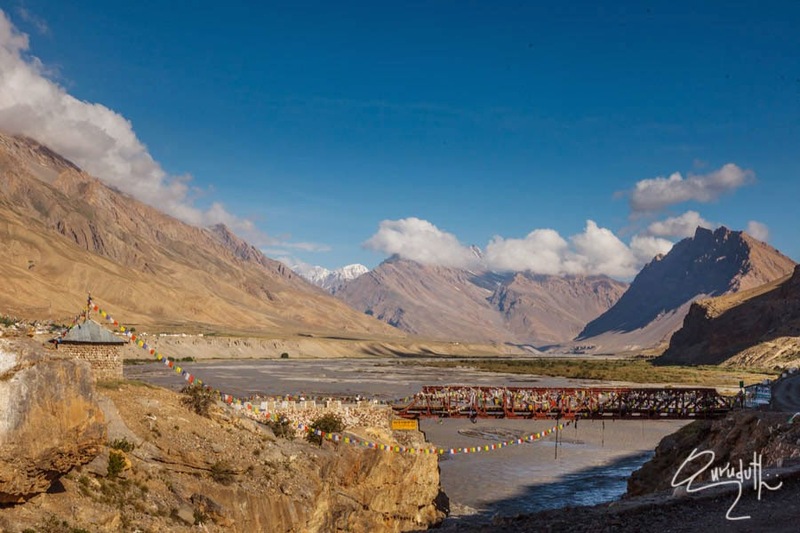 As per the local tradition and the travelers faith and belief, almost all vehicles that pass through this PASS take a detour to go to Kunzum’s Gompa to pay obeisance to the deity and pray for their safe onward journey. 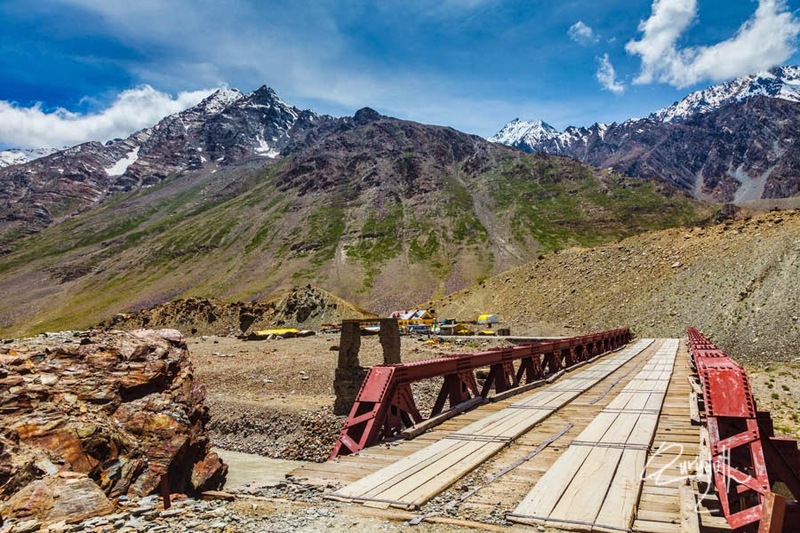 This whole mountain top “Pass” offers spectacular views of “Bara-Sigri glacier”, the second longest glacier in the world. 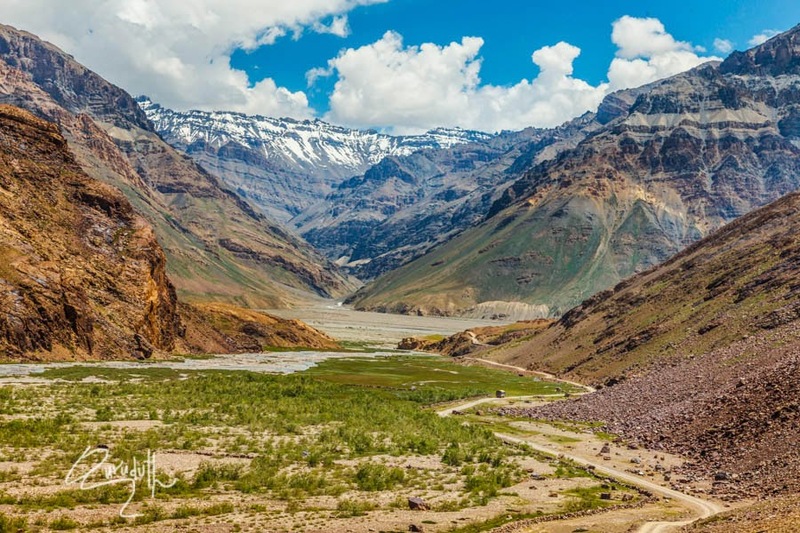 Also visible from the top of the pass are the “Chandra-Bhaga” Mountain and Spiti Valley. Up till now from “Losar” village right up to “kunzum La” temple, we were climbing steep up. 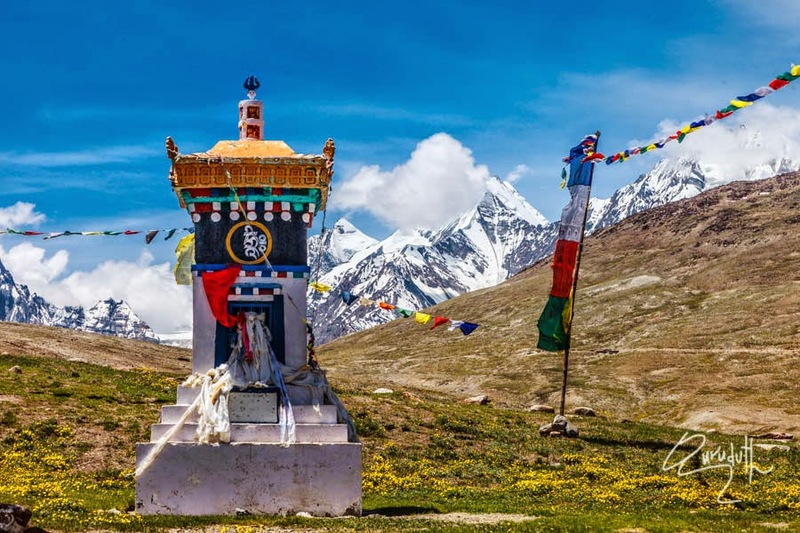 Now from “Kunzum La” temple right upto “Chandratal Lake” and “Batal” village, it is a constant steep descend of about 14 Km long distance, that too on a winding snake like narrow dangerous road that has very sharp “Hair Pin Bends”. 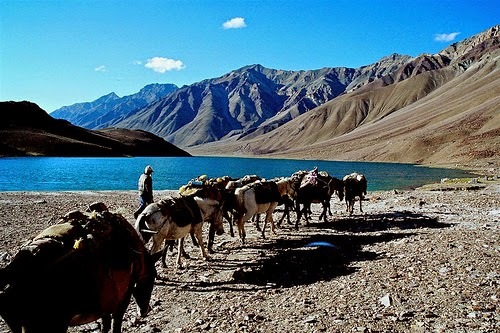 After descending for about 10 Km from Kunzum La, there is a detour on the Right hand side of the road which leads to “Chandra Tal” Lake. From this junction it is one of the most worst motorable road of 4Km. 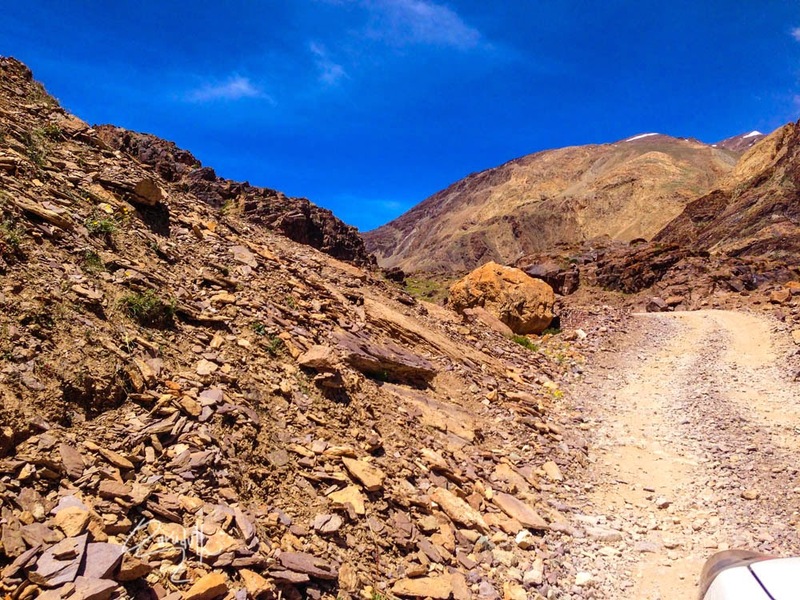 Then to reach the Lake from the last dead end of the road, we had to trek another two Km climbing up-words, on foot. 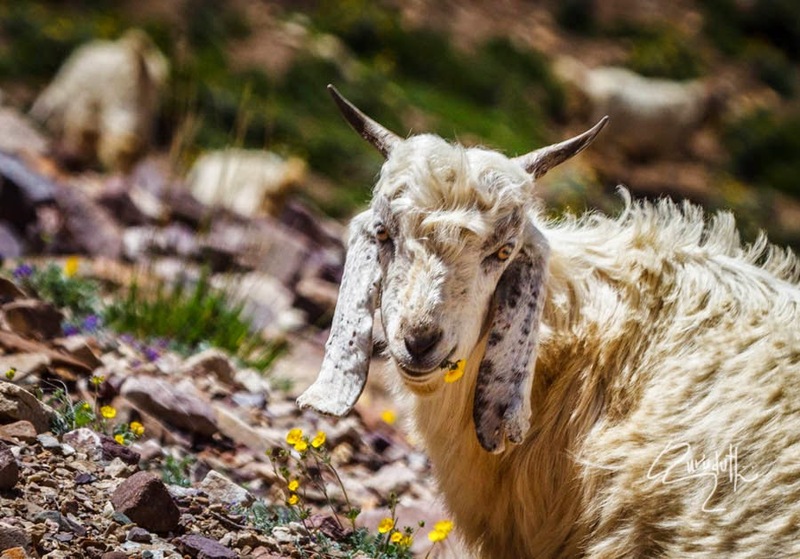 The trek was dreadful, exhausting, excruciating, breathless panting and gasping. 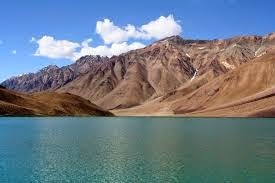 But once we viewed the majestic, splendid, imposing Chandratal Lake, it was blissfully divine and refreshing. Vast meadows on the banks of the lake are the camping sites. 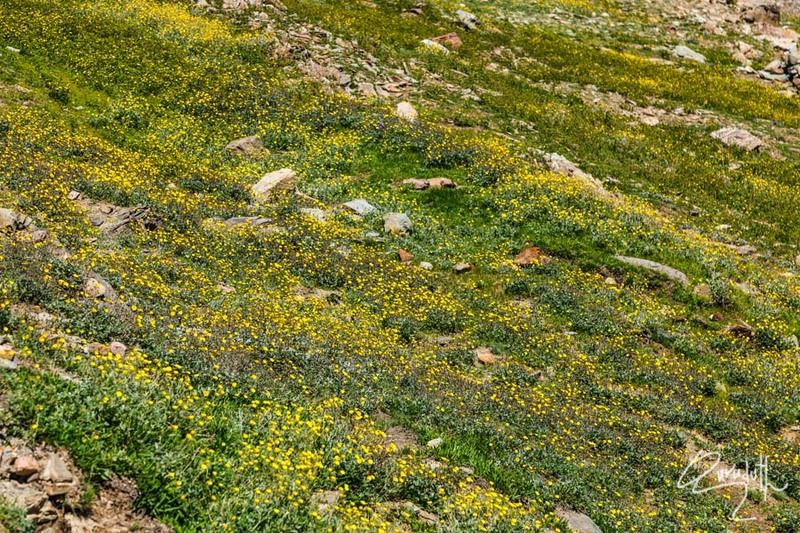 During springtime, these meadows are carpeted with hundreds of kinds of wildflowers. 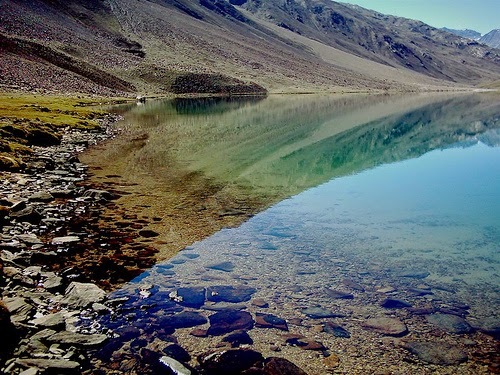 The most surprising thing about this lake is that there is no visible source of this lake but there is a visible outlet of this lake which means that water to this lake comes from underground as well as from the surrounding Galaciers. 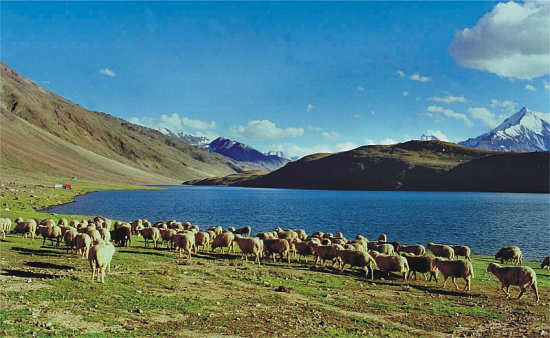 The lake is situated on the “Samudra Tapu” plateau, which overlooks the “Chandra River”. 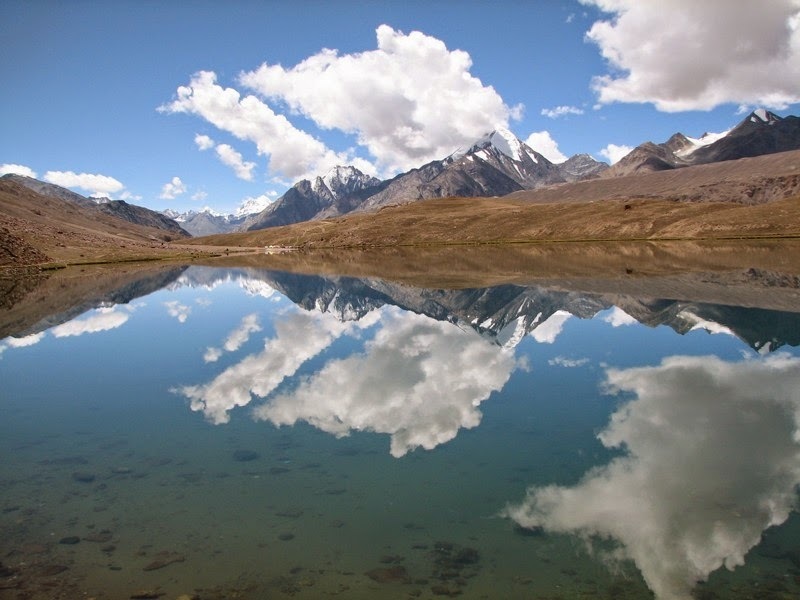 The lake is one of two high-altitude wetlands of India which have been designated as Ramsar sites. 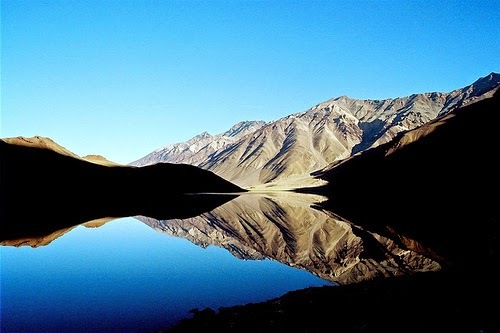 Chandra Tal, Moon lake is Boasting of a circumference of about 2.5 kms, the deep blue-water of Chandra Tal Lake is the source of the Chandra river. 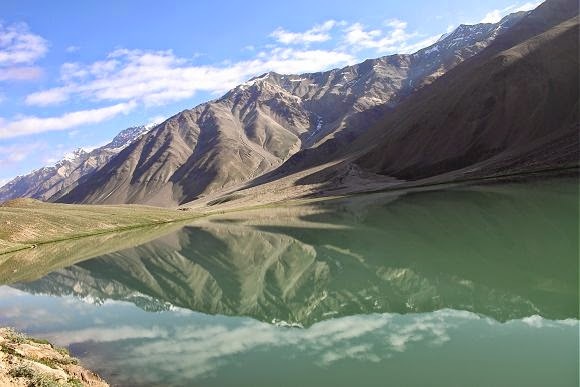 The Chandratal lake, once a halting place for traders who went to Spiti and the Kullu valley from Tibet and Ladakh attracts a large number of photographers and adventure lovers. 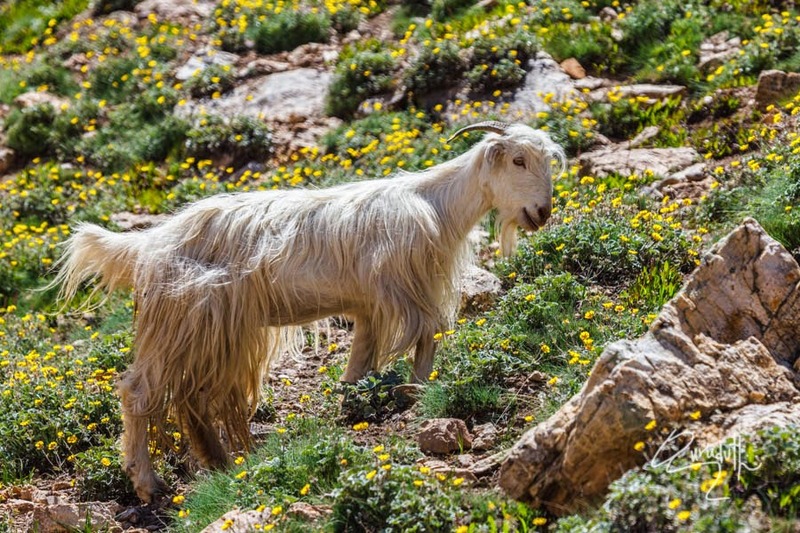 The mountains peaks with snow caps and slopes around the valley rise up to 3000 meters to 6300 meters. 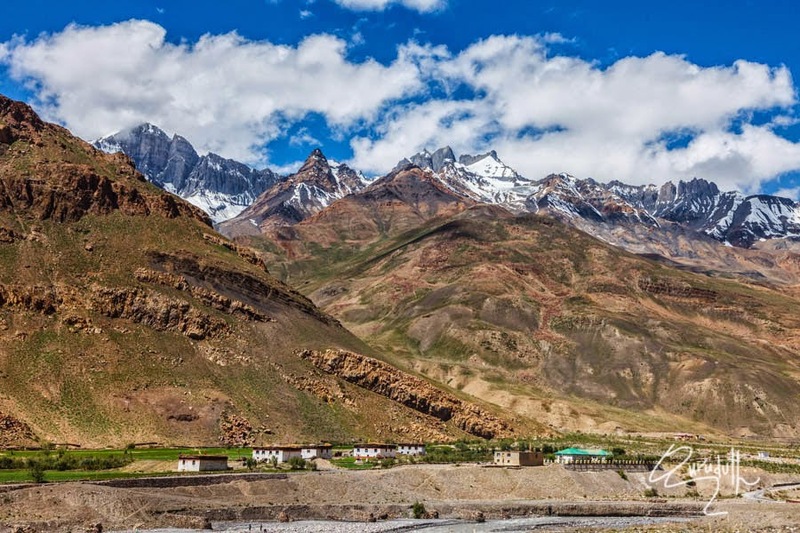 The mountain ranges are called Moulkila and Chandrabhaga which challenge mountaineers. This crystal clear blue water lake lies in a broad grassy plain, which in ancient times was a glaciers. 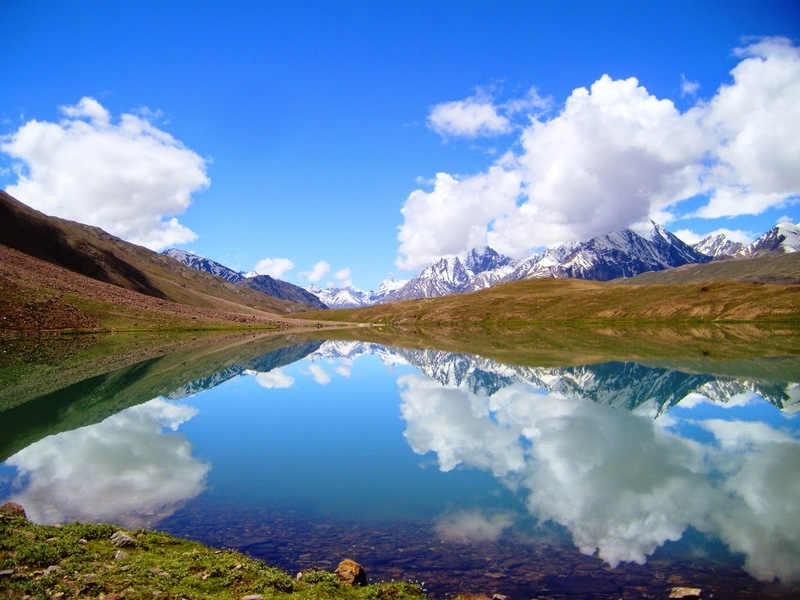 The lake is accessible on foot from “Batal” village as well as from “Kunzum La Pass” from late May to early October. 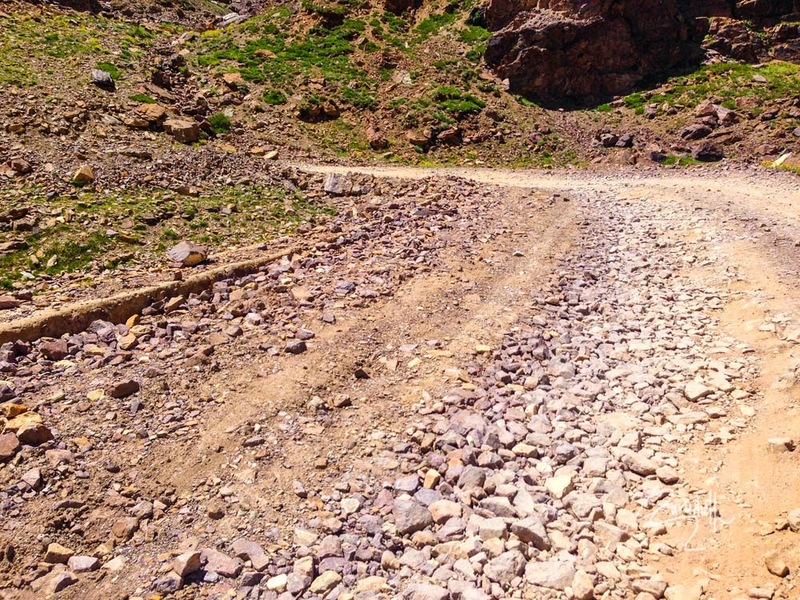 There is also a motorable road from Batal which is 14 km away from “Chandra Taal”, but before August, its condition can be bad. 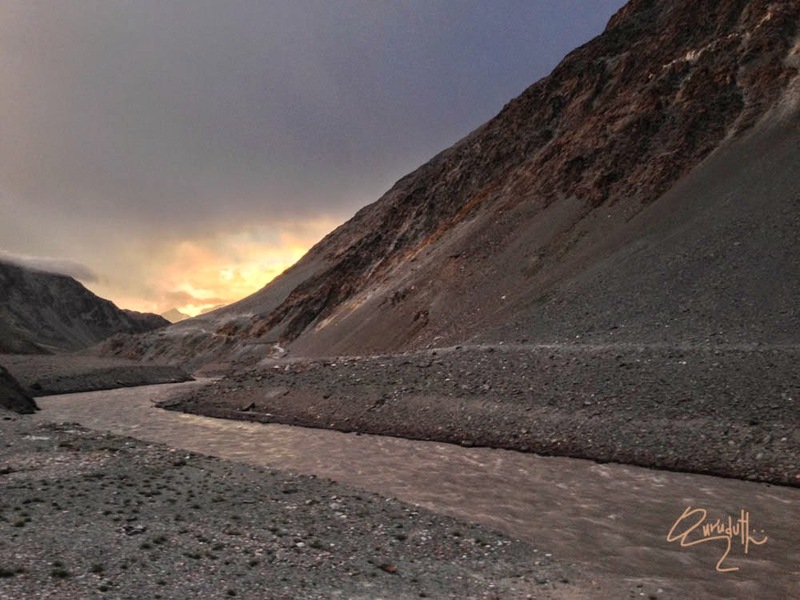 The road from Kunzum Pass is accessible only on foot, and it is about 8 km from Chandra Taal. 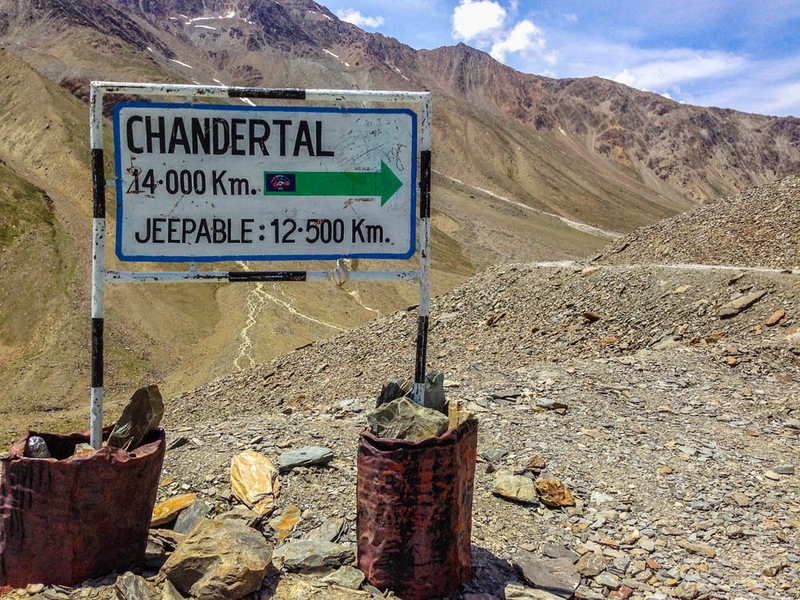 According to Hindu mythology, Chandratal is the place where Indra, the King of Gods, came down on his chariot to transport Yudhishthira, eldest of the five Pandavas, in his mortal form to Swarga (heaven). Locals folklore believes that the fairies visit the lake at night. 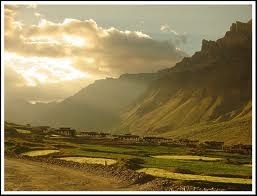 From “Chandra Tal” we drove back to the main road. Ater joining at the main road we drove towards “Batal” hamlet which is another 10 Km from here. 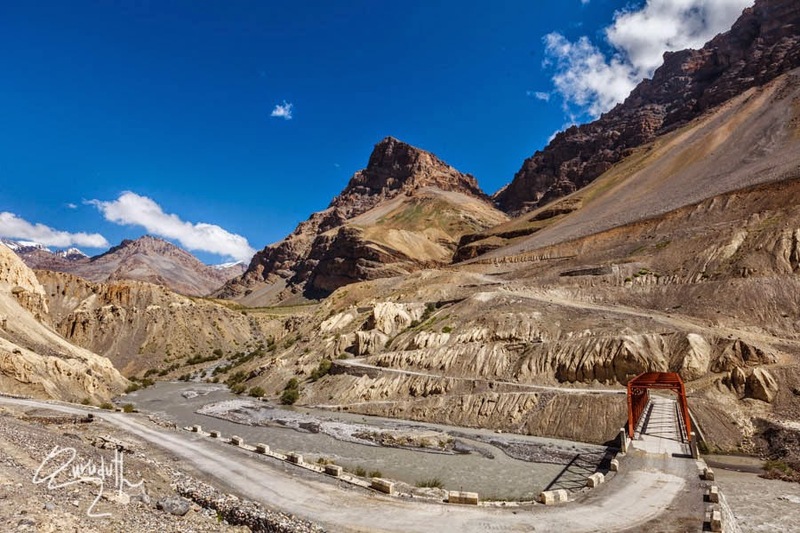 It’s again a constant deep treacherous descend.”Batal” is a hamlet which is settled on the bank of “River Chandra” and is connected by a concrete bridge. 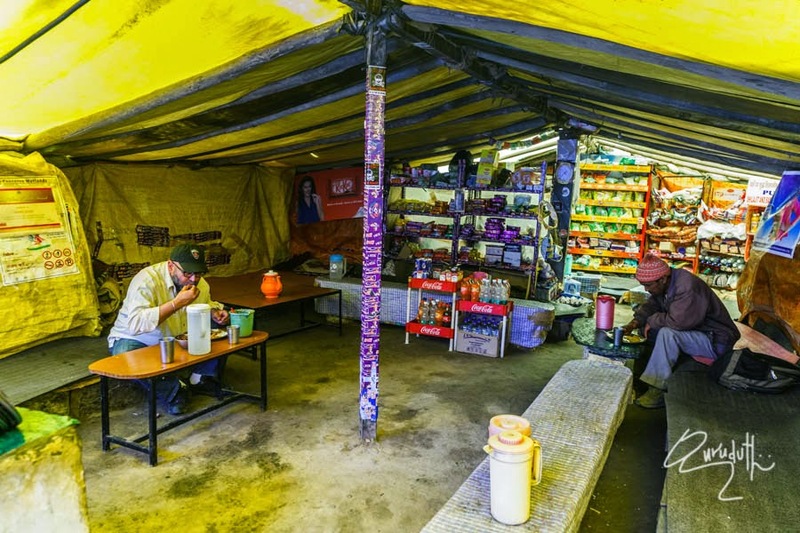 It has a small “Shak” typye of makeshift shelters, which provides, food, bed and refreshments such as biscuits, wafers, tea, coffe, omletets, tissue paper rolls, paper napkins, etc. 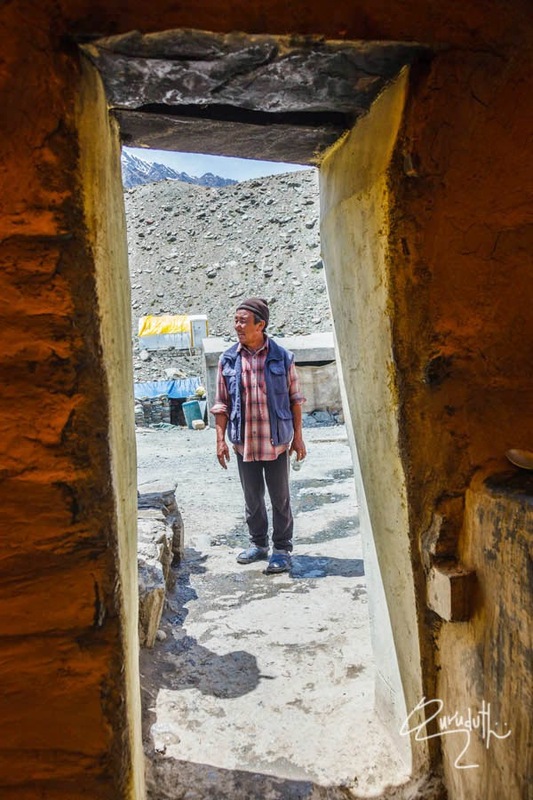 These shanty shelters are functional only in the summer months. 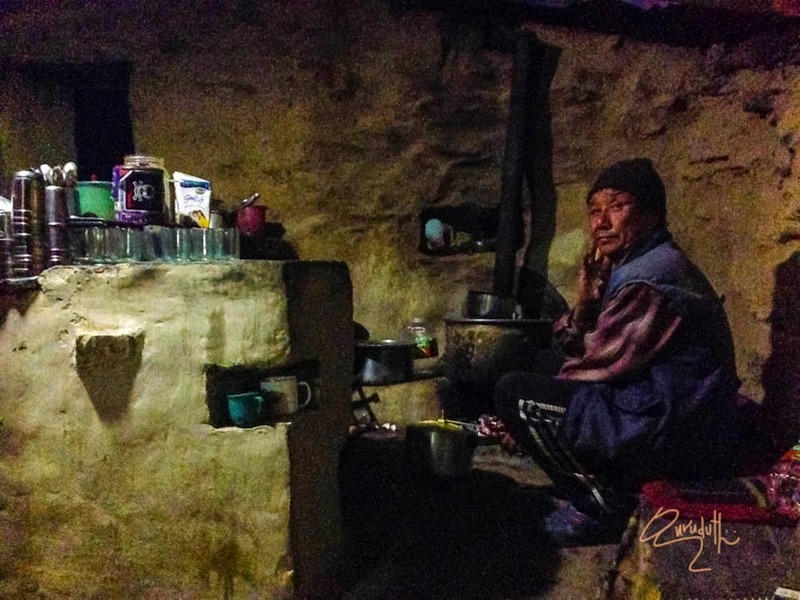 We stopped at a makeshift shelter which was names as “kunzum Den”. 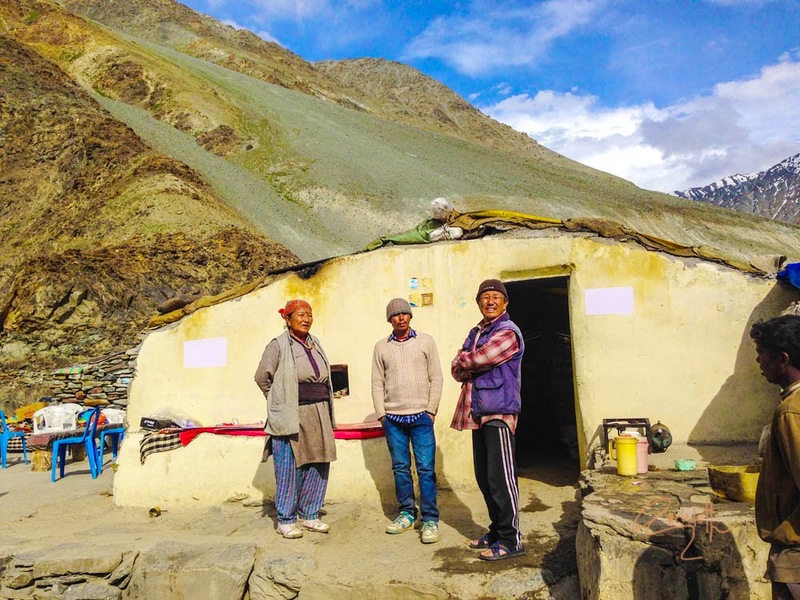 The family who runs this “Shelter”, sets up this shelter only during the tourist season and come here every year from “Manali” just to cater to the needs of the tourists. The “Man of the Shelter DEN” is Mr.-----. Then like “Trophies” he showed us the framed copies of many cutting of “National News papers” of different dates and years, praising his family as “Heros” who saved almost more than 100s lives of the tourists, who at different times would have got stranded, in crises such as, sudden snowfall, sudden torrential rains and sudden avalanches, in and around this area. 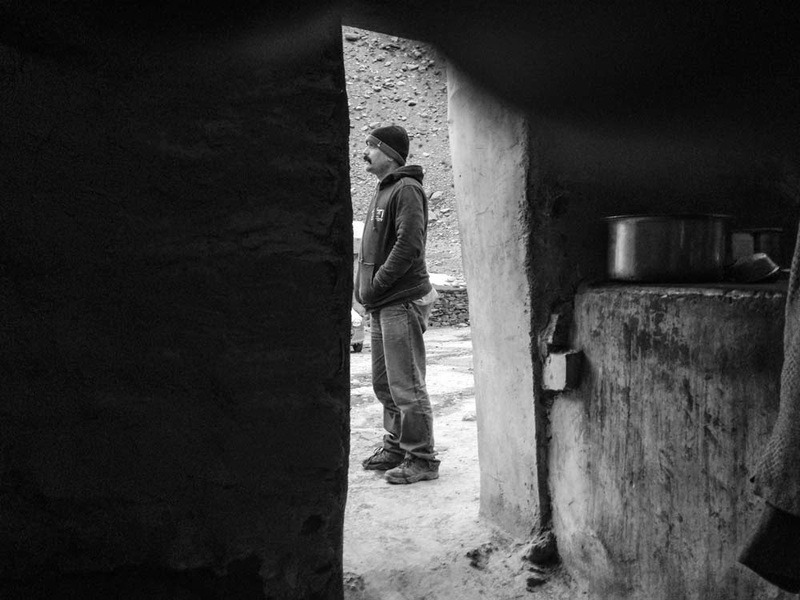 By the time we reached at “Batal” at the shelter, it must have been only 3:30 PM. So we still had nearly quarter of the day at our disposal to drive down on our further journey. While sipping “Hot Tea”, Mr. Dorjay yong, sat next to us and very seriously looked at our tinny ALTO car and after lot of casual talking, he took us into confidence and very authoritatively and convincingly advised us that during the tourist season, he has been coming at this place @ Batal, since his youth and he knows every inch of this disastrous area. He genuinely advised us that it was not advisable to drive at this hour of the day to go to Grampoo. He suggested that we should stay for the night and not take risk of getting our small car either washed off across the killer “Nallas” or get the bottom portion of the car seriously damaged beyond repairs. He suggested that we could stay if we want, in the government PWD concrete guest house, which is right opposite to his shelter. 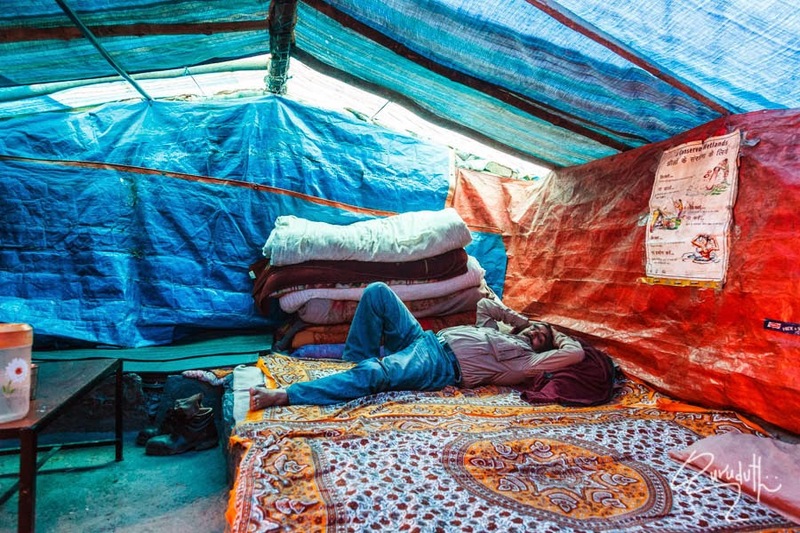 He said so because he didn’t want us to think that he wanted to make money, by providing night food and shelter by forcing us to stay for the night. The serious reason that he advised us to stay for the night was that we should leave for Grampoo earliest in the morning say by 4 Am even before the twilight. 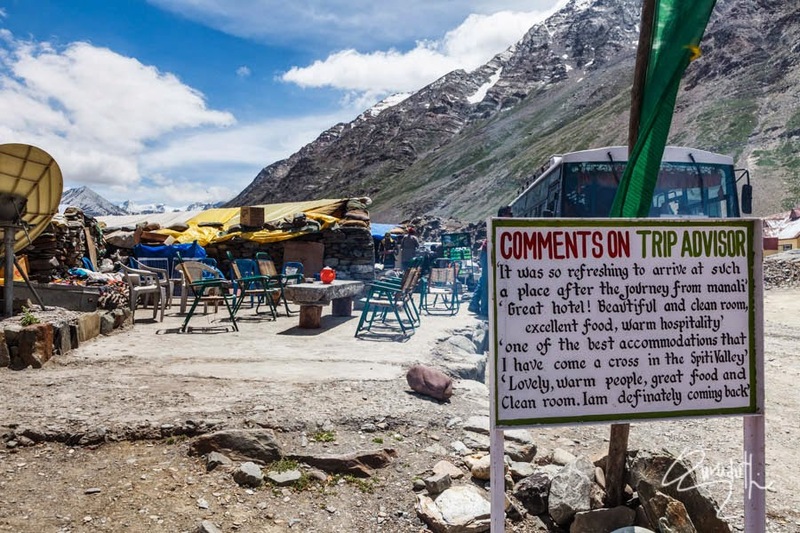 As per his advise, by the late night Glaciers stop melting and the water recedes to a level of just two to three feet depth only, more over the water is clean and we can see very clearly the submerged boulders and rock. So while driving we could avoid running over boulders, and can avoid getting stuck in between “Nallas. 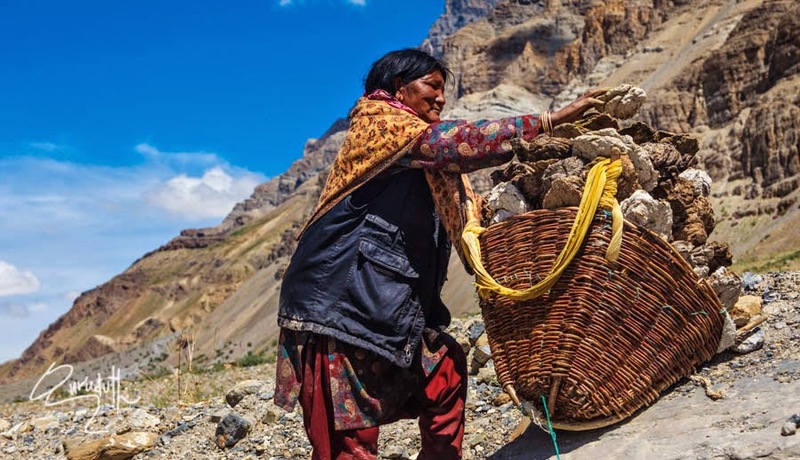 Glaciers start melting only after 9 Am, when the sun is at its full heat and then the “Nallas” get flooded and come gushing down turbulently churning with it tones of slush-mud, rocks and boulders. By evening the water levels of the Nallas swell upto 5 ft to 6 ft and you can’t see anything like rock or boulder in the muddy water. The force of this turbulent water is enough to wash away medium size motor vehicles. .
Day (12), 21st July 2014. Then listening to Mr. Dorjay experienced and valuable advise, Gurudatt and myself decided to stay for the night and next day to leave by 5AM. While leaving Batal 5 in the morning we made sure that at least few vehicles should be following us so that in case of any disaster, some one may come to our rescue. As soon as we sat in to our car, to our good luck, we saw a Lorry coming. All along we drove in front of that loaded with (Potatoes and Green Peas), lorry. Because of our stressful driving through these notorious Nallas, we could neither click the pictures nor could we shoot the videos of dangerous drive through these Nalla Crossing. So I am uploading the respective U-Tube Links of each Nalla, to show you guys how dangerious it is to cross these ferocious Nallas that too in a small Alto-car like ours. When we reached at the very rirst “Nall” called as “Choti Dhara”, water was really hardly two feet deep, and it was clear and while crossing we could easily avoid the boulders and we crossed the ‘First serious Hurdle” without any mishap. So we realised that it was a million dollar advice given to us by that veteran Mr Dorjey. In our prayers we thanked him million times. Then again after driving for few Km away, the second hurdle approached, the second “Nalla called as the “Baadhi Dhara”. Here also water level was only 2 to 3 feet, flow was moderate and boulders could be seen. But the boulders were so big that whatever I did to the best of my driving ability, I couldn't cruise through without getting stuck on one of the big boulders. My car got stuck and refused to move further or come back. By then Gurudatt got down from the car. First on his own, he tried to push the car from behind, but no success. Then Gurudatt requested to the people who were sitting in side of the lorry, that was following us. Out of three, two of them got down, and all three including Guru pushed the car and we came out successfully. So with two to three minutes we were out and again on the road. For couple of Kms the drive was rickety and rough but somehow we were able to manage it fine. Then at last the most awaited merciless notorious, ferocious, “Monstrous-Demon-Dragon” called as the mighty “Pagal Nalla” approached and welcomed us with its open fangs, wide stretched claws, breathing lames of Fire through his nostrils and spraying tonnes and tonnes of freezing Ice water on every passing vehicle and was furiously swinging his long-neck and huge-head while plundering and flinging rocks and boulders on every passing vehicle. And with is powerful waging tail he would try to knock down almost every small vehicle that unfortunately came in contact with the powerful wagging tail. Somehow courageously we took the plunge to cross the monstrous “Pagal Nalla”. Previous night a huge chunk of a rock had fallen in the middle of the Nalla-crossing. 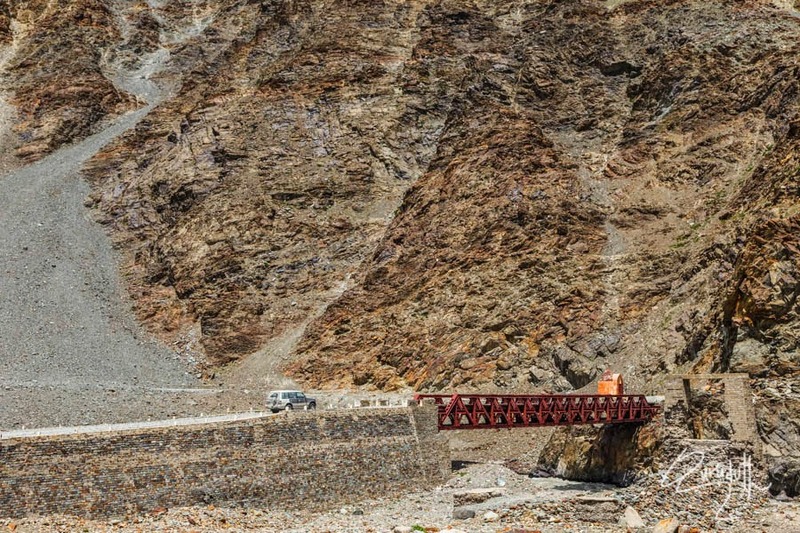 It had practically blocked the road in such a way that only one side of the road which was butting the mountain was completely blocked and the other end of the road which was on the extreme edge side of the mountain there was hardly three to four feet clearance. So I had only one choice that come what may, I had to take the risk of driving as close to the extreme edge of the road as possible. How carefully I tried to drive, I got badly badly stuck. Out of the four tyers of my car only rear two were touching the rocky ground and two front were dangling in the air. Whatever I did, nothing helped. Guru and those three lorry fellows tried to help. My poor ALTO was sand witched inbetween the huge chunk of rock on the left side and one of the underneath boulders that had got stuck under the chassis, which resulted in lifting the bottom of my car above the ground. Poor ALTO did its best to move but tyres had no grip. So every effort was useless. Same time while Guru and Lorry gang were helping by doing all possible efforts. Suddenly Icey frozen water level started rising fast and within ten minutes water level rose to 4 feet and all the water started gushing inside the car. 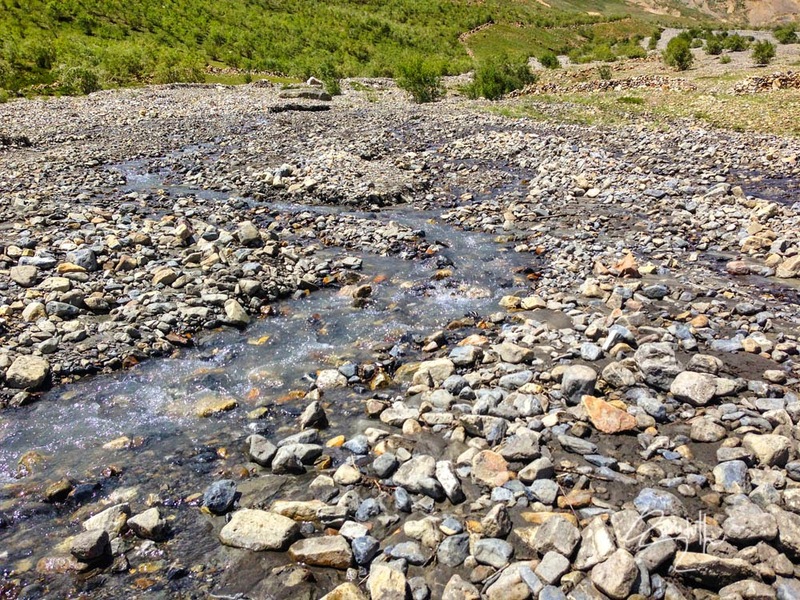 As the process of struggling to help, water rising was going on, suddenly tonnes of rocks and boulders started trembling down. Almost every one ran including myself. I left the car and ran for my life. It was half an hour and we were still stuck. I knew we are marooned and doomed. 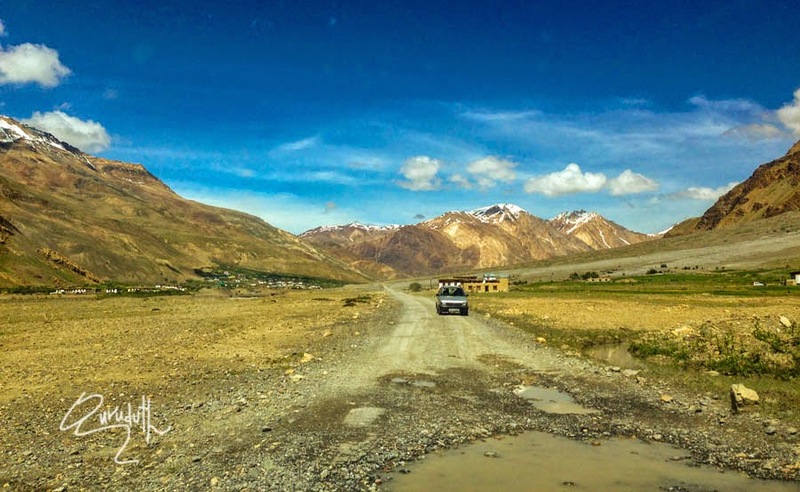 But the only hopeful blessing was that because the road was so narrow that no vehicle could go further on either side of the road unless our marooned ALTO was cleared. 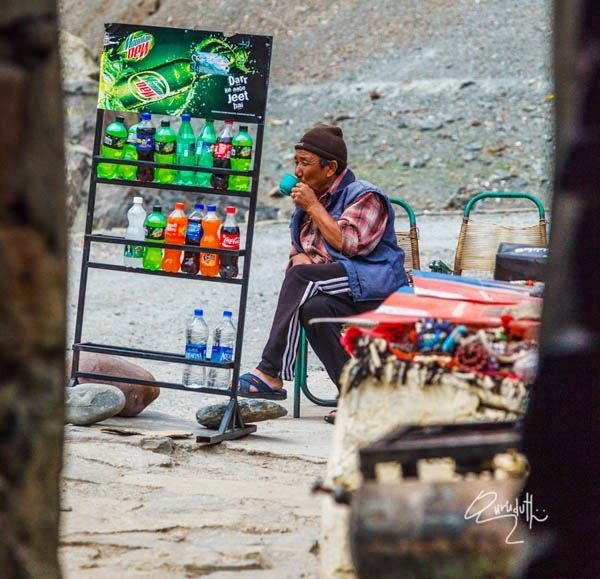 After a little while, two local tourist vans came from the opposite side, that must have come from Keylong and were going to towards Kaza. Seeing the road blocked because of our marooned car. All the passengers from both the vans came to our rescue. All of them practically lifted out ALTO and took it to the other end of the road. Gurudatt and myself thanked each and every one and we started our last leg of the journey. 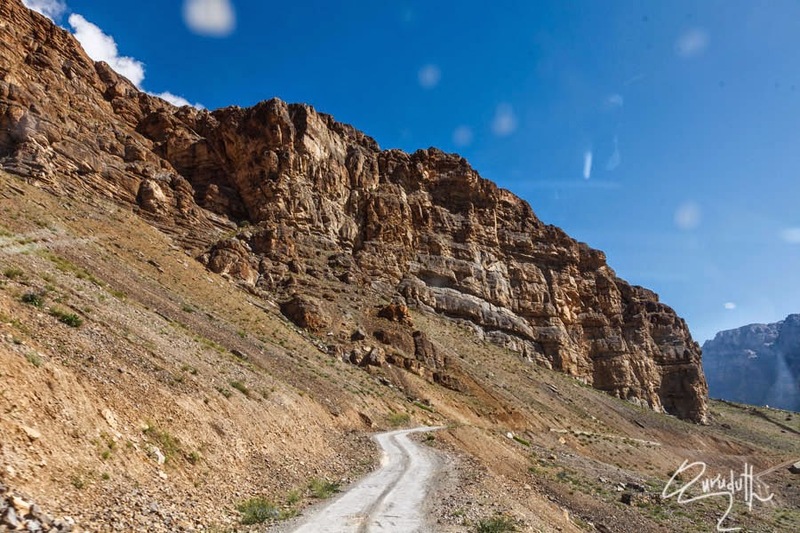 One of the utmost precipitous, devastating, deadliest, toughest, nightmarish, stressful, traumatic, shocking and horrifying stretch of the “Hell Road”. No vehicle whoever big or small it may be, are not safe on this “Hell Road”. 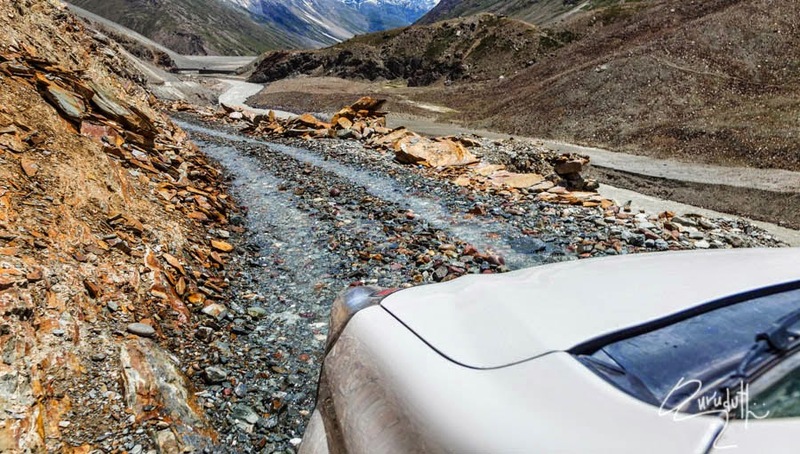 The road itself is narrow and vary dangerously fatal. But on top of that it is most traumatically dreadful to cross through fully swollen “Roaring and Soaring” notorious “Three-Nallas” which are called as, (first one) is called as (Chooti Dhara); then the second one is--- (Baadhi Dhara) and the (third one) is---notorious (Pagal Nalla). Crossing them all is a “Herculean Task”. 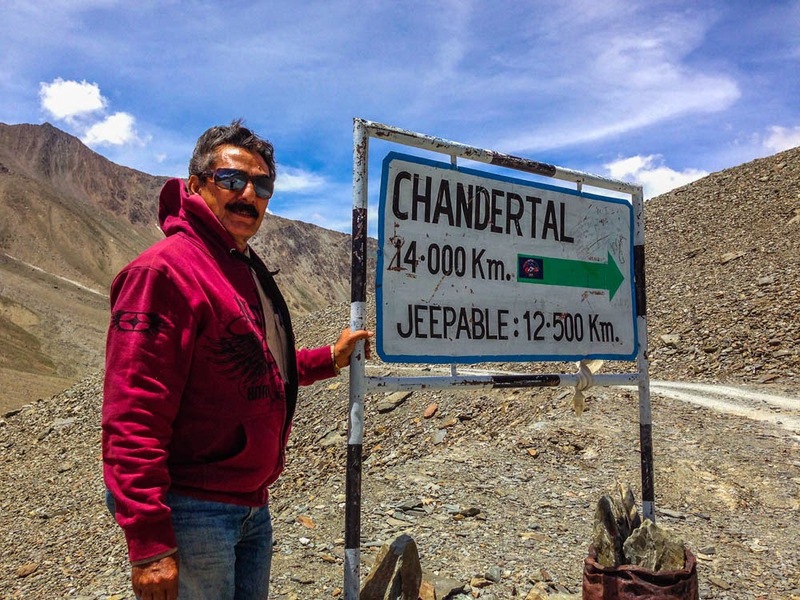 None of the drivers, however expert or experienced driver, he may be, cannot cross these notorious “Nallas: without getting his vehicle badly stuck or without getting his vehicle badly damaged and mangled beyond anyone’s wildest imagination. To crossover these “Notorious Nallas” is an agonising and excruciating “Agni Pariksha” for all the vehicle drivers. The main worries of the small vehicle drivers that bother them are that either their vehicles may get washed by the forceful turbulent gushing muddy deep water or their small vehicle may get stuck up by those disastrous huge rocks and boulders those have sharp knife edges which are fully submerged and can’t be seen underneath the turbulently flowing churning muddy water, which invariably hammer-hard at the bottom of all the vehicle and invariably damage either petrol tank, or Gear box, or engine chamber, or break spring plates. 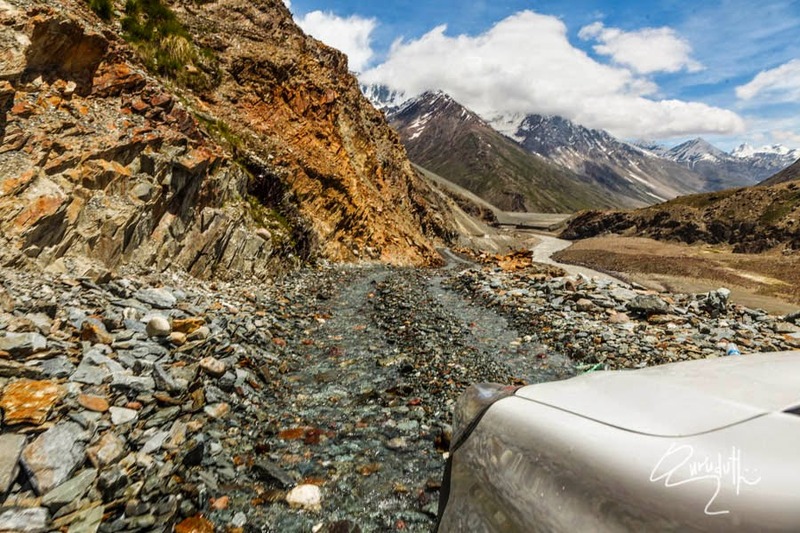 Whatever may be, these unseen merciless rocks and sharp knife-edged boulders prove their might by mangling and tangling almost all the vehicle. So imagine Gurudatt’s and my traumatic nightmare. Right from Shimla to “Batal” (about 600 Km) every single one warned us that our “Small Mosquito ALTO” in front of those gigantic towering mountains, treacherous terrines and un- predictive “notorious “Nallas” would save us or herself from the merciless onslaught of “Kaza to “Grampoo” “Hell Road” Because of this warning from almost each and every local inhabitant of Kinnaur district, Spiti distric had warned us and had advised us to go back to Shimla and from there take Kulu Manali Rohtan Pass road to go to Leh. 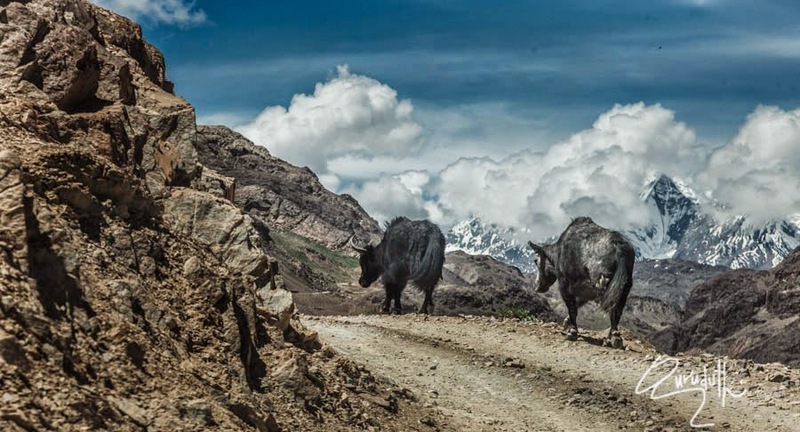 At kaza we became talk of the town and everybody would searmarkishky point at us, Saying that we two were specimen who are committing “Hara-Kiri” by trying to go to Gramoo using ALTO------ which was hobbling, wobbling, wheezing, squeaking while making all sorts of engine's stressful gruntings. But some how Gurudatt and I achieved our mission impossible of crossing over to Grampoo. We were very sure that some how some divine would come to our rescue and would reach us safely to our destination. Excellent Journey... great, Ashok Sir!